Jacques Chauveau was a French businessman with a passion for the navy, born August 27, 1925 in Caen (Normandy), and died June 28, 2003 in St. Petersburg (Russia). In 1944, at the age of 18, he enlisted in the 2nd Armored Division of General Leclerc, where he worked on the campaign in Germany. Back from Berchtesgaden, he studied law in England and began working life in the field of industry and advanced technology such as computers and the metal (especially steel and balls bearing systems). His activity has not so much to do with the maritime domain. However, he quickly spends his spare time to his passion: the sea. This passion grows to his home: In 1975, Jacques Chauveau and his wife Madeleine buy the Malouinière of la Ville Bague, a real "secondary home" for the shipowners of the eighteenth century built in order to escape the stuffy world of Saint-Malo while remaining close enough to care for their ships. The couple proceed in twenty years to a long process of restoration of the Malouinière and the park. Without subsidies, but through the Malraux's law, la Ville Bague regain its splendor. This jewel of the architecture of St Malo is a veritable museum of Navy, as was his apartment in Paris or his office. Jacques Chauveau was also a great racer. Among his boat, we could find a beautiful 6M JI called "Vert-Galant" it was common to come across to Cowes, the Nioulargue and other great sailing places. AMERAMI is an association created in 1975 by Luc-Marie Bayle, naval officer and director at the time of the National Maritime Museum. It was recognized of public utility by decree of June 26, 1981. His presidency was assured until 1982 by Aymar Achille-Fould and Jacques Chauveau until 2000. 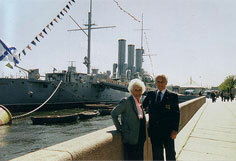 The association is a pioneer in the field of the Safeguarding of the French maritime heritage. Its purpose is to search for old boats with a real interest in terms of their construction or their use and to restore and enhance them by finding such a venue, or even to make them navigate again. At its inception in 1975, the association was already aware that the old boats were becoming increasingly rare and very quickly it began to look for ships representing several eras and many functions in order to preserve them. With the arrival ofJacques Chauveau as the new president, the whole spirit of the collectionor became the guideline of AMERAMI and we could then see evolve a natural-size museum but also numerous demonstrations on the sea . The most remarkable fact of President Jacques Chauveau is undoubtedly the installation of submarine "Argonaute (S636)" at the Museum of Science and Industry of La Villette in Paris. In 1989 it made ​​its last trip up the canal Ourcq to be placed in a pit specially designed for this purpose next to the Geode and today knows a big success. Marité is a French barque built in 1923. It is now the last wood Newfoundlander existing. These boats were used for fishing for cod in the seas of Newfoundland. Marité is 47 meters long, has 650 square meters of sails and move 450 tons for a draft of 4.20 meters. Jacques Chauveau has unfortunately not had the pleasure to see the success of his highly committed action to the return of Marité in France. His friend Gerard d'Aboville and himself have indeed worked with great patience and diplomacy to the creation of a public interest group wich can buy this boat, the last witness of these great moments from the sea. It is indeed Jacques Chauveau, as part of his research, who learned in the year 1999 that Marité was for sale. Abandoned at a port of the Faroe Islands since 1973 and promised to destruction, it was later restored to its original from 1978 to 1987 by five young Swedes who used the boat at cruise. Approaching Gerard d'Aboville, president of the Maritime and rivers Heritage Foundation maritime, Jacques Chauveau begins with him a long negociation process. Four years later, only months after Jacques Chauveau's death, a public interest group is created that includes the cities of Rouen and Fecamp and several General Councils of Normandie. This group. also obtained the support of the Regional Council of Haute-Normandie. The group of young Swedes who restored the Marité was, fortunately, well aware that its place was in France. Thus, while several large fortunes were interested in this sale, the five young people have enough time to prepare for the French. 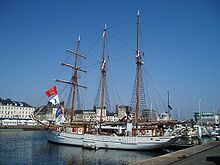 Marité is finally redeemed in June 2004 and takes Rouen as its port. Jacques Chauveau doesn't want to limit himselfto the French maritime heritage. His actions have earned him quickly indeed an international reputation in the maritime field. And he also participates in the preservation and protection of maritime heritage in the global World Ship Trust, a Non Governmental Organization (NGO) in which he represents France. The World Ship Trust has awarded the trophy to the association AMERAMI for submission of Argonaut submarine at the Museum of Science and Industry. Christian Poncelet, President of the Senate, gave this reward to Jacques Chauveau as president of the association, on December 16 1998, in the salons of the Presidency of the Senate, in the presence of Sir Michael Jay, ambassador of Great Britain, Admiral Jean-Charles Lefebvre, Chief of Staff of the Navy, representatives of the Office of the World Ship Trust as well as a large number of civilian and military, British, Portuguese and French. Jacques Chauveau then became president of the World Ship Trust. There is a particularly active promotion of global maritime heritage. 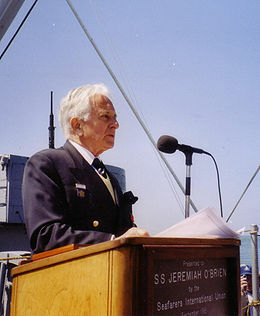 It was during one of these activities he died June 28, 2003, only hours after presenting the International Maritime Heritage Award to a foundation for the preservation of Russian battleship Aurora in St. Petersburg. But Jacques Chauveau had already said: ''I do not want to freeze myself becoming, according to the law of nature, an authoritarian, splenetic, and stubborn, obsessive prey to the desire to immiscing in other's affairs."